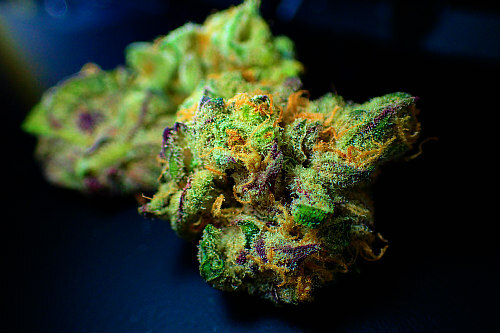 Dutch cannabis is the best and strongest weed there is. At least, a lot of people have always thought that. Is it the case? There is still a good deal of truth in it! Dutch weed is actually richer in THC than any other weed from Europe. And Dutch hash isn’t bad in that respect either. This is apparent from a study by scientists from the University of Bath and King’s College in London which was published in the journal Addiction. The London University study sheds light on the increase in THC content and the price of weed in Europe between 2006 and 2016. It is the first time that a study had been conducted on this scale. The scientists drew their results from the data of 28 EU member states, Norway and Turkey. The data was collected by the European Monitoring Centre for Drugs and Drug Addiction (EMCDDA). Dutch weed lovers were sitting on the edge of their chairs. Their wait was rewarded: Dutch weed proves to be the strongest in terms of the percentage of THC (Tetrahydrocannabinol). The study restricted itself to the THC level because the scientists considered this to be the most important aspect of weed. Judge for yourself. Whichever way you look at it, our national pride is reaffirmed. Want to know more about the workings of Tetrahydrocannabinol? Check out the blog! 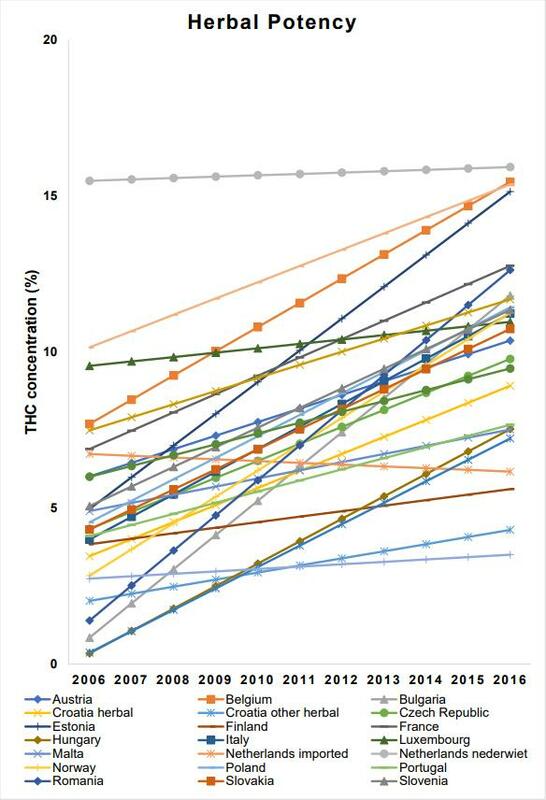 In 2016, Dutch weed was the strongest weed in Europe based on THC (see fig. 1) It is striking that weed cultivated in our country was already much stronger in 2006, compared to weed from other countries. It was already around 15.5% at that time. During the next decade, the strength remained pretty much constant (16% in 2016). You cannot say the same about the weed from countries like Belgium and Portugal. The THC level there goes up and up and approaches the level of our Dutch weed. Dutch imported weed is slightly less strong than our domestically cultivated weed. You can find it back at position number 7 if you look at 2016. That is still stronger than the average European cannabis. Dutch pot also does well as far as strength is concerned (see fig. 2). In 2006 Dutch hash was still Europe’s richest for THC. In 2008 we handed the baton over to what was for us an unexpected player. Denmark. French hash too was on the up and up and around 2013 cannabis resins originating in France were on average stronger than those from the Netherlands. Up until 2016 the situation didn’t change although the brown stimulants from Belgium, Spain, Czech Republic and Norway were catching up. Note that the figures illustrate the average weed from the various countries. 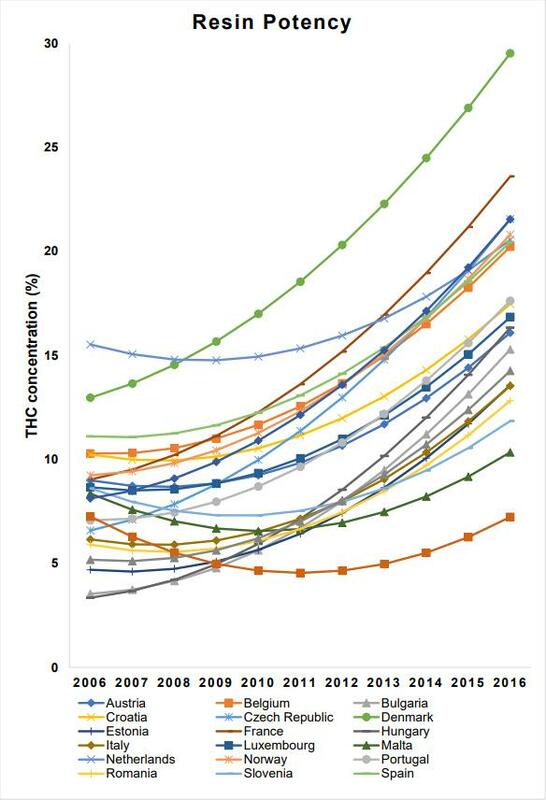 The THC percentage in some weed strains can be (a lot) higher than the average. Getting excited? We have a large range of THC-rich weed seeds ready and waiting for you. With these seeds you can cultivate the strongest weed in the whole of Europe yourself! With all the pollen that comes off it you can make really strong pot. The Blonde Russian Lady is an extremely strong Indica with a THC percentage that’s all of 22%! It’s a hybrid between the famous White Widow® and AK-47®. Blonde Russian Lady is our own house brand and in 1996 it won a cannabis cup. So it’s been around for a good while now and not without reason. You get 5 seeds for under 20 euro! The extremely strong Liberty Haze is a hybridisation of the famed G13 and a fast flowering Chem Dawg 91. The hybrid weed seeds (mix of Indica and Sativa) from Barneys Farm have a THC content of a full 25%! A good 11% stronger than the average Dutch weed in 2016. You can buy 5 seeds from us for around 40 euro. This delicious hash tastes fresh but with a touch of tartness and partly thanks to its strength it won the High Times Cannabis Cup for 2011! Bubble Gum Auto is an autoflower though still unbelievably rich in THC. The percentage varies from 20 right up to 25%! 5 seeds from our own brand will cost you a mere 20 euros. The characteristic sweet smell and taste makes these weed seeds tremendously popular with a large public. The anti-stress qualities of this Bubble Gum autoflower are also highly prized. As the strength - and for many people that’s the same thing as quality - of weed and hash rose in past years, so too did the price. Between 2006 and 2016 the price of 1 gramme of European hash went up from around € 8.21 to € 12.27. The price of European-cultivated weed also rose sharply: from € 7.36 in 2006 to € 12.22 in 2016. There is also a darker side to this study. The scientists from the University of Bath and King’s College state that the chance of developing psychoses and schizophrenia is increased by the use of weed. That is connected with the increasing value of THC in European cannabis. THC is the psychoactive substance in weed which can cause these kinds of long-term disorders. It appears from the study that these disorders occur more often when the level of CBD (Cannabidiol) does not go up to match the THC level. This is alarming because CBD reduces the chance of long-term disorders. CBD also reduces the psychoactive effects of THC. If the CBD percentage is increased you feel clearer but still get a substantial percentage of THC. Whereas the percentages of the substances used to be closer together, they are growing further and further apart especially when the THC percentage gets above 20%. That comes about because a choice is made during cultivation and selection between either a high percentage of CBD or a high percentage of THC. Yet there are also seeds which have an equivalent ratio of THC to CBD. Those are the seeds which are popular with medicinal users who derive benefit from THC.